UPDATE: Version 17.11 has been re-released (build 17.11.07) to fix a crash on MP3s with album art - a bug since v17.03. Version 17.11 is now available for DOWNLOAD! This new version of Shotcut has quite a few fixes plus the follow set of changes and additions. 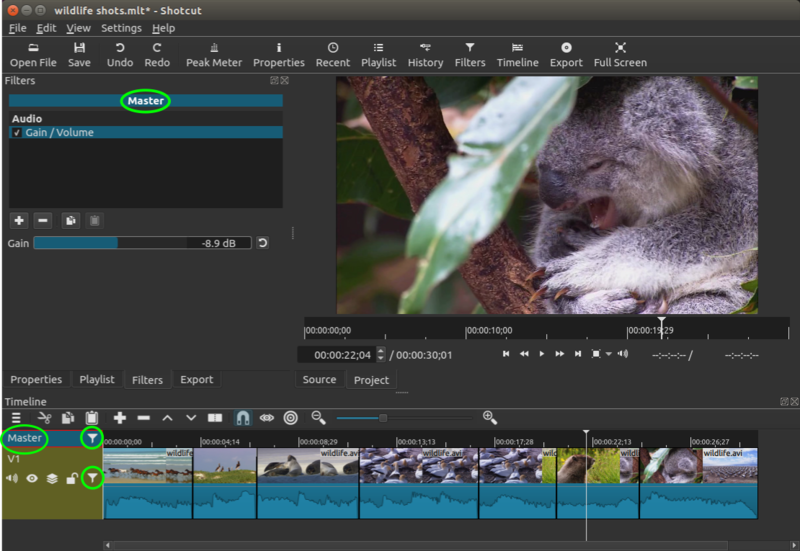 Shotcut lets you attach filters to many things - not only clips on the Timeline. You can also attach filters to a track or even the entire timeline. In previous blog and forum posts, I have referred to the top left corner block of the timeline as “cornerstone” for lack of another reference. Also, I compared the ability to filter the entire timeline (the result after compositing and mixing) as similar to the “master out” volume slider on a sound mixing console. Therefore, I added the label Master to this selectable block. Furthermore, if you had added a filter to a track (by selecting the track head) or to Master, then you could easily forget about it. Or it could have even occurred by accident! Therefore, Shotcut now shows a Filters icon on a track head if it has filters. See the screenshot below. The Filters panel is showing the filters applied to Master because it is selected, and there is a Filters icon on the Master track head to indicate that it has filters.